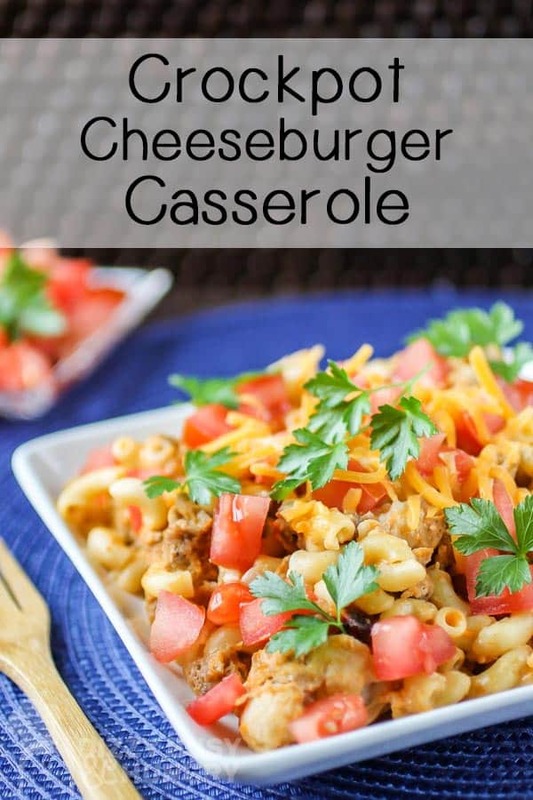 Crockpot Cheeseburger Casserole | Dizzy Busy and Hungry! 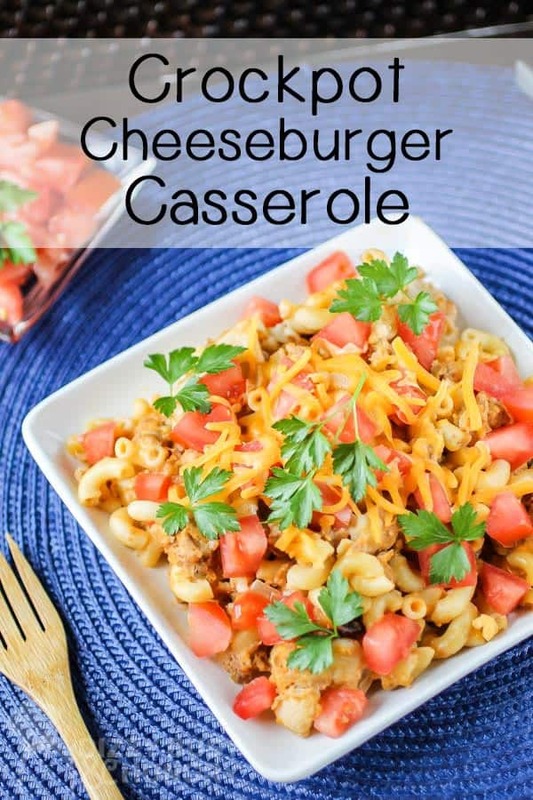 Here’s an easy and delicious cheeseburger casserole recipe the whole family will love. Only 15 minutes of prep and the crock pot does the rest…and no one will ever know there’s a hidden veggie for extra nutritional impact! If a hamburger and a serving of mac and cheese got married, this is what their kids would look like! Have you ever had a mac and cheese cheeseburger? I couldn’t believe it when I saw that option on a menu once. It’s literally a cheeseburger topped with mac and cheese. Of course, my younger son ordered it, and I have to admit, it was totally awesome. Which gave me an idea to come up with a crock pot recipe to copy that mac and cheese cheeseburger taste! 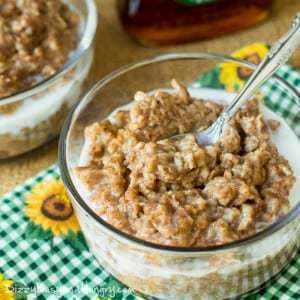 Easy – I made it a crock pot recipe, because slow cooking is just so darn simple. 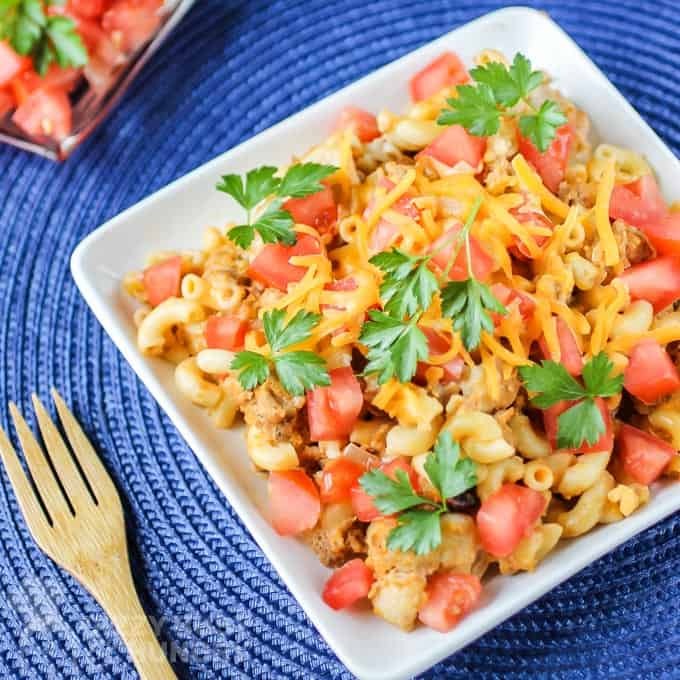 Lightened up – I used ground turkey instead of beef. Filling – I used a fiber-enriched pasta. Tasty – I added sharp cheddar cheese, mixed in ketchup, and topped it off with chopped pickles and tomatoes. Yum! Crock pot recipes are great for feeding a crowd, or in my case, two hungry teen boys. We need a lot of food even though we are only a family of four! 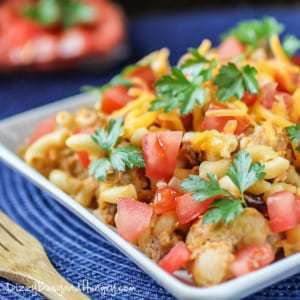 So I have a few other recipes like this in my arsenal as well, like my Slow Cooker Cauliflower Mac and Cheese. Or, if you are looking for something with a tomato-based sauce, this Slow Cooker Baked Ziti with Mushrooms and Spinach is delicious! We enjoy it often. 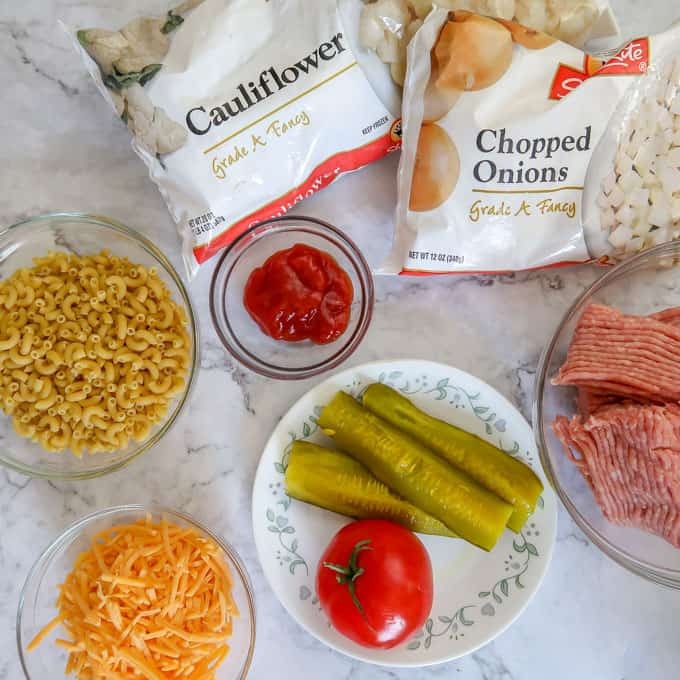 Don’t forget the tomatoes and pickles for the best cheeseburger experience from this casserole! You will need ground turkey, chopped onion (I use frozen…yep, I’m too lazy to chop! ), ketchup, frozen cauliflower, shredded sharp cheddar, macaroni, pickles, and a tomato. Also a bit of salt, and pepper to taste. Boil a pot of water and cook the macaroni until it just starts to become tender – definitely no more than 5 minutes. While waiting for the pasta to cook, combine the ground turkey, onion, ketchup, and salt in a large bowl. 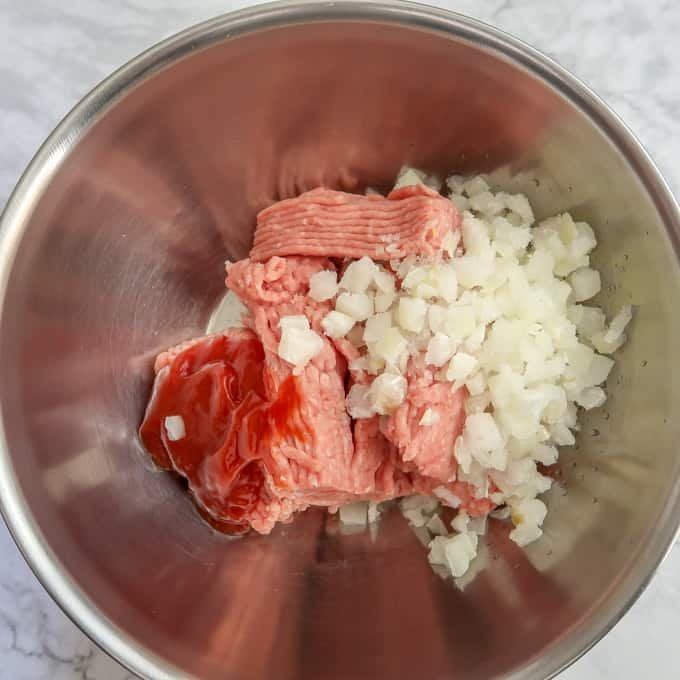 Combine the ground turkey (or beef), onion, and ketchup in a large bowl. Next add the shredded cheddar and cauliflower. 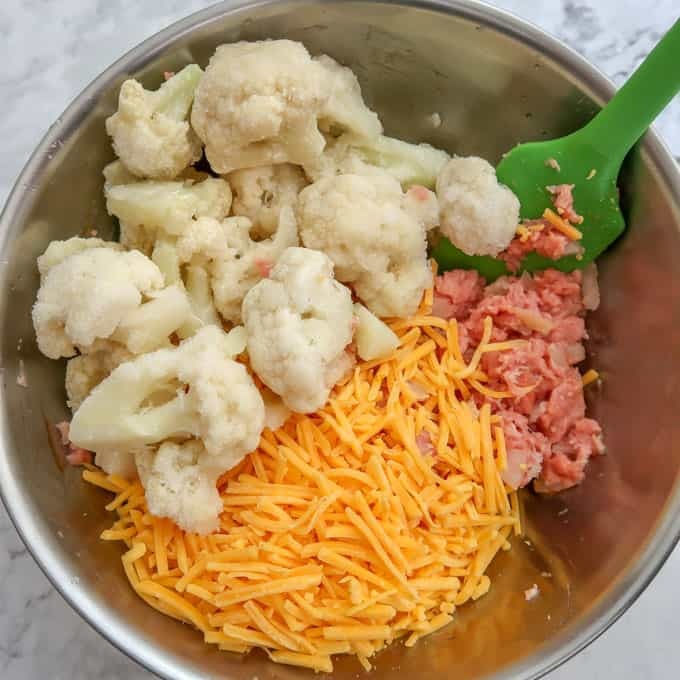 Add the cauliflower and shredded cheese to the bowl. Give it a good mix! 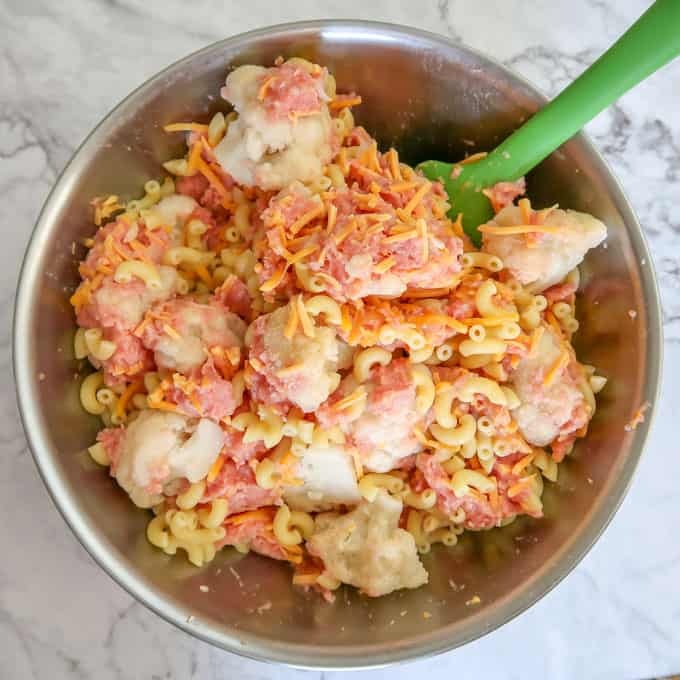 Once the macaroni is done (remember it will still be fairly hard since you only cooked it for 5 minutes), add it to the bowl. Add the macaroni (already lightly cooked) into the large bowl as well. Mix gently until everything is fairly well distributed. Add the mixture to the crock pot and cook on high 3-4 hours or low 5-6 hours. Place the mixture in the crockpot and let it work it’s magic! Do I need to brown the ground turkey? There’s no need to brown the ground turkey before placing it in the crockpot. However, if you would like to substitute ground beef, either make sure it is extra lean, or brown it ahead of time so you can drain off the extra grease. Do I need to thaw the frozen onion or cauliflower? In the interest of keeping this recipe as simple as possible, I have never bothered with thawing. Just toss them in while still frozen! Can I use fresh onion or cauliflower? Absolutely! Fresh is always better, if you have the time! Can I just mix everything right in the slow cooker instead of in a bowl? Yes, you definitely can. I personally find it easier to mix in my nice light stainless steel bowls, but of course that creates another dish to wash, so that’s a good reason to do everything right in the crock pot. Don’t overcook the pasta before adding to the turkey mixture. Boil it no more than 5 minutes. Crockpots can definitely cook differently. I advise you to check the casserole at the 2 hour mark (for cooking on high) or the 4 hour mark (for cooking on low), and if the turkey is all cooked, turn the crockpot to warm until you are ready to eat. If you need a recipe that can cook in the crockpot all day while you are away, this probably isn’t the best recipe to use. Overcooking causes the edges to get crunchy and the middle will be mushy. Be sure to use really flavorful sharp cheddar for the best taste. Make sure you don’t skip the pickles and tomatoes, they are not just garnish, they really help round out the cheeseburger experience! Cheesy pasta with ground turkey or beef is the foundation of the great family favorite recipe! More of a beef fan? Go ahead and substitute extra lean ground beef for the ground turkey. Just a note to reiterate – if you aren’t using EXTRA lean ground beef, you may want to brown it first to be able to drain off the extra fat, or your casserole will be greasy. Do you like your casseroles a little creamier? Substitute 8 ounces of Velveeta for 1 cup of the shredded cheddar. Looking for more zing? Add hot sauce to taste, or put it out when serving for everyone to use as they like. Hoping for a chophouse burger experience? When serving, drizzle some steak sauce on top. 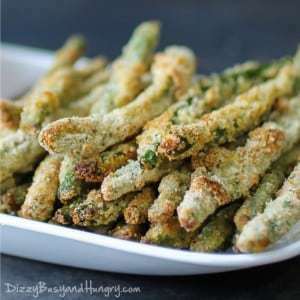 This dish pairs well with a side salad, Baked Dill Fries or Ramen Noodle Coleslaw. And I also invite you to follow me on FACEBOOK, PINTEREST, or INSTAGRAM to keep up with what’s going on in my kitchen. The great taste of cheeseburgers with the convenience of crockpot cooking, plus a hidden veggie for extra nutritional impact! Cook the pasta until just becoming tender (about 5 minutes). Drain. While the pasta is cooking, mix the turkey, ketchup, onion, and salt in a large bowl. Add pepper if desired. 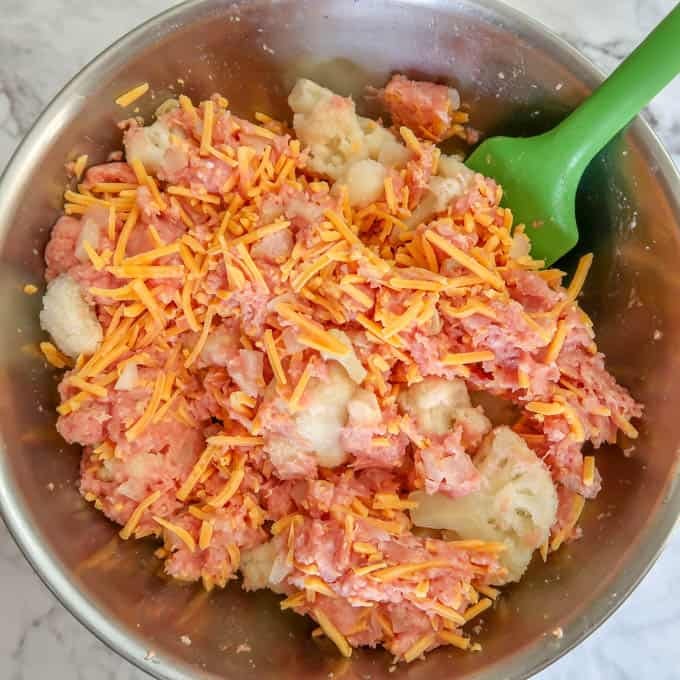 Add the frozen cauliflower, and shredded cheddar, and combine. Once the macaroni is done, drain it and fold it into the turkey mixture. Place entire mixture into the crockpot and cook on high for 3-4 hours or on low for 5-6 hours. When plating, sprinkle each serving with the chopped tomatoes and pickles, or set out in bowls for self-service. There is no need to brown the turkey or beef beforehand. There is no need to thaw the onion or cauliflower beforehand. The pasta will just be very slightly cooked when you add it to the mixture for the crockpot. Be careful to not overdo it or it will be mushy by the time you serve it. The pickles and tomatoes are important to get the cheeseburger experience! 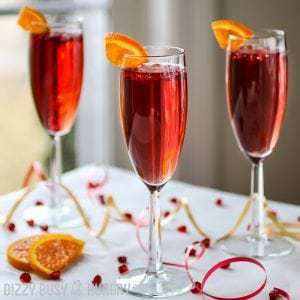 Update Notes: This post was originally published in April 2014, but was republished with tips, step by step photos, and a recipe change in April 2019. 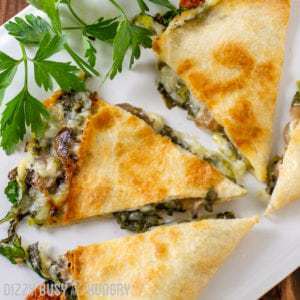 You might also like this Slow Cooker Bacon Cheeseburger Pie, or these yummy Cheeseburger Quesadillas! So you don’t brown the turkey meat before putting it in the Crock-Pot? 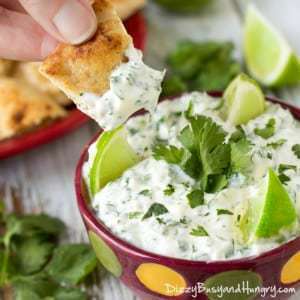 Such a perfect weeknight staple! Thanks for sharing at Home Sweet Home! What a delicious and easy idea! I love it! 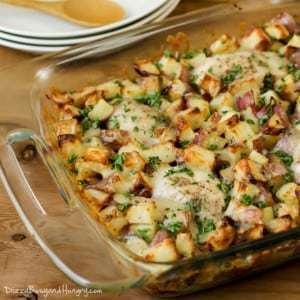 Pinned – Thanks for sharing your great recipes at the What’s for Dinner party. My kids would love this! Thank you for sharing at the To Grandma’s House We Go DIY, Crafts, Recipes and More link party! Pinned! Sounds yummy! Thaks for the recipe! Thank you for sharing on Merry Monday! Hope to see ya next week! I, too, was disappointed. The recipe doesn’t call for any liquid. I had to add 3 cups of water half way through in fear of it burning. It came out mushy and tasteless. I added a bunch of salt and pepper but doesn’t taste real good. I wanted to love this recipe so much. I am curious how you cooked it without burning as there’s no liquid. Also, is it supposed to be so bland? Hi Stacey, I am sorry to hear you did not have success with this recipe. I have made it many times and it turned out fine for me. I imagine the water you added contributed to it becoming mushy and tasteless, but I understand why you added it. My suggestion would be to brown the ground turkey first, and then follow the directions but reduce the cooking time to low for 3-4 hours or so (which will be OK because the turkey will be cooked already). I haven’t ever actually done it that way, but that is what I would try (I am thinking that I might do that the next time I make this, just to test it and see if that works out for me, too). 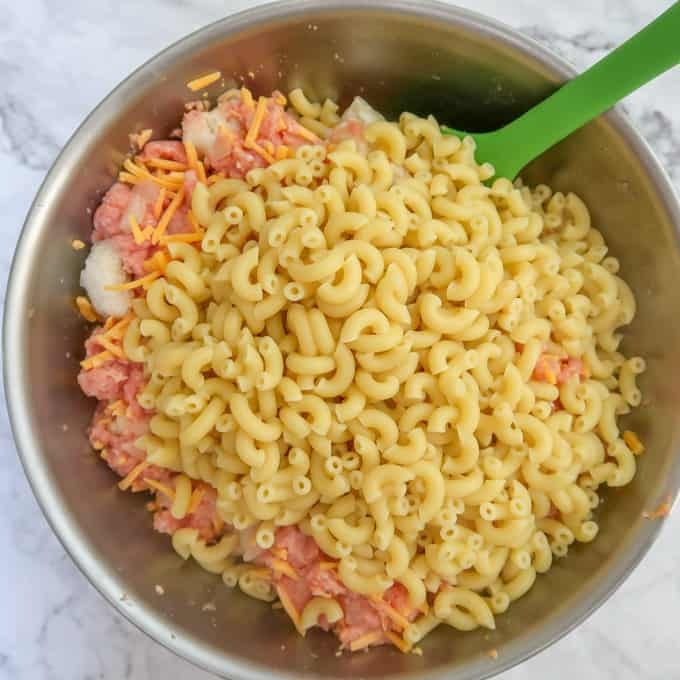 My kids love the flavor from the ground turkey, the cheese sauce, and the shredded cheddar (make sure you get good cheddar! ), although my husband typically squirts some hot sauce on top of his to better suit his adult taste buds. Also, the pickles are very important in adding flavor to this as well. Again, I am sorry to hear you were disappointed, but I thank you for stopping by and I appreciate your honest feedback! It was great! I didn’t use the pickles and threw in a lot more cheese to make up for not having cheese sauce. I only cooked it for roughly 4 hrs because the pasta, onion, cheese combo started baking to the side of the crockpot and in some places burned a wee bit. Mixed it all up and scraped off the caked stuff off the bottom…it was delicious!! I wonder what the carb and calorie counts would be if I didn’t add the noodles? 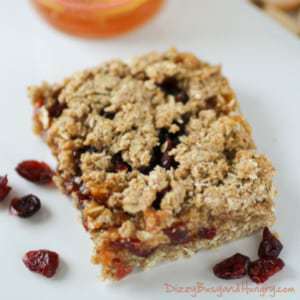 This recipe was a MAJOR DISAPPOINTMENT! 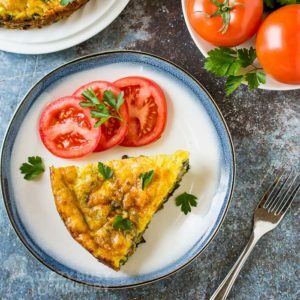 I work all day and need a recipe that takes 8-9 hours to cook. When I got home and looked at the crock pot, dinner looked like dog food. I mixed it up hoping for better results and the macaroni was absolute mush. Never making this again. Sorry for the bad review but I don’t want others to get home to the same situation I had yesterday. I am sorry to hear that! I appreciate the feedback. I am not sure why it didn’t work out for you, but sometimes it can be a difference in the brand of pasta or the cook temperature of the crock pot. I definitely agree that it isn’t the prettiest dish (you can see why in the picture I dressed it up with tomato chunks and fresh parsley!) In any event, thanks for stopping by and I am sorry you did not have luck with this dish. We unfortunately don’t have “24 ounces frozen cauliflower with reduced-fat cheese sauce” where I live. Is there something with which I could substitute? Should I make my own cheese sauce and add frozen/fresh cauliflower, or do you have another idea? How much cheese sauce does it have? Looks delicious, and I would love to make it! I know you tried to make this a healthy meal but I was wondering would I be able to substitute ground beef for the Ground turkey? sorry my husband would go crazy if he knew it was ground turkey he is a beef guy since we raise our own beef cows. I know the feeling when it comes to old blog photos! I cringe at some of mine. One day I’ll go back and redo a few! 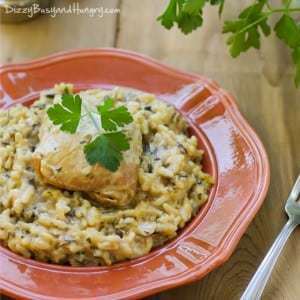 I love all the flavors in this meal and so easy when you get the help from a slow cooker! This is a lovely idea! 🙂 The fresh tomatoes really help to enliven it, I bet! 🙂 I’ll have to make this for my boys; I know they’d enjoy it! 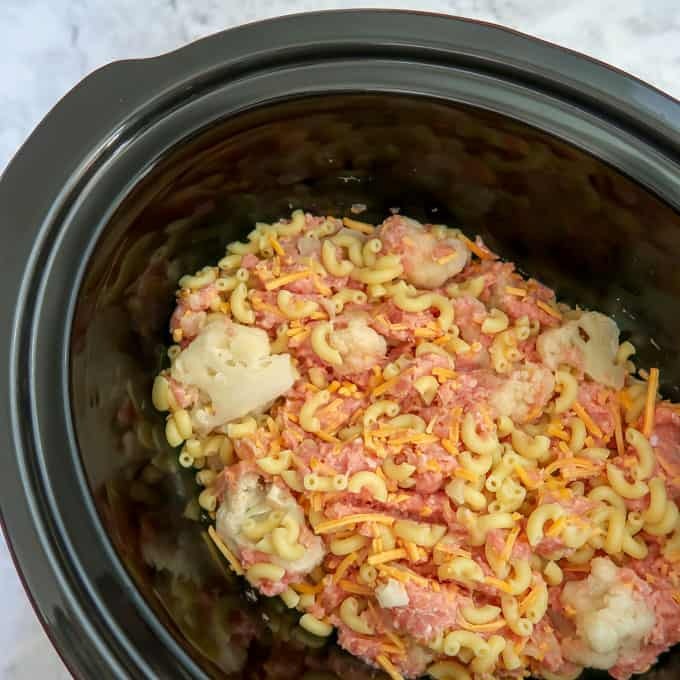 Love that this is a crock pot recipe—looks yummy! This photo is definitely a keeper! Looks fresh and tasty! Photography is a work in progress for me for sure as well:) Have a great week! Your photography is lovely, Kristin and definite improvements, lol. I cringe when I look at last year’s photos and I still have to find the time to re-shoot them! But it’s all part of the learning process. How else can we measure how far we’ve come if we can’t look back and laugh at our old ones? lol. This recipe looks yummy. Thanks for sharing it!